The Housing Starts for August, at a seasonally adjusted annual rate, came at 1, 282,000 units, which is +9.2% above July’s revised rate of 1,174,00 units and better than what the market was expecting, which was 1.24 Million units. 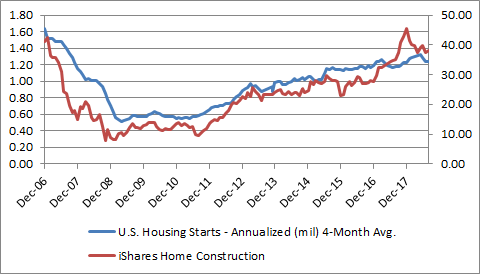 The single family units starts increased by +1.9% in August and the housing starts for buildings with 5+ units increased by +27.3% from July rate. This that townhouses, condominiums and rental apartments buildings are starting at a higher rate than single-family houses. Year-over-year growth currently stands at 1.0 percent at the national level, which is well below the 3.1 percent rate we saw this time last year as well as the 2.6 percent rate from August 2016. Rent growth is also pacing well behind the overall rate of inflation, which stands at 2.9 percent as of the latest data release, and is similarly lagging growth in average hourly earnings which have increased by 2.7 percent over the past twelve months. The seasonally adjusted rate of building permits issued in August was 1,229,000 units, which is -5.7% below July’s revised rate of ,303,000 units, and also lower than the market estimates of 1.31 million units. The single-family unit authorizations decreased by -5.7% from July and the authorization for 5+ units buildings declined by -8.0% from July. 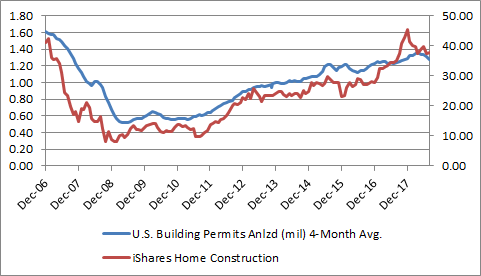 The iShares Home Construction ETF, ITB, tracks the housing starts and building permits quite well, with approximately a 3-month lead time (See Fig. 1 and Fig. 2). It made an all time high of 46.56 during the week of January 22, 2018 (see Fig. 3). Since then, however, it has declined by -19.00%. At the moment it is precariously placed. 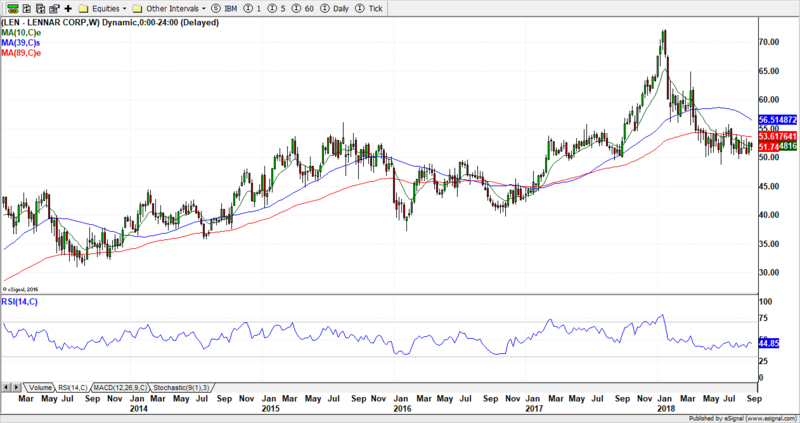 It has retraced 38.2% of the gain from February 2016 lows and is forming a rounding bottom. 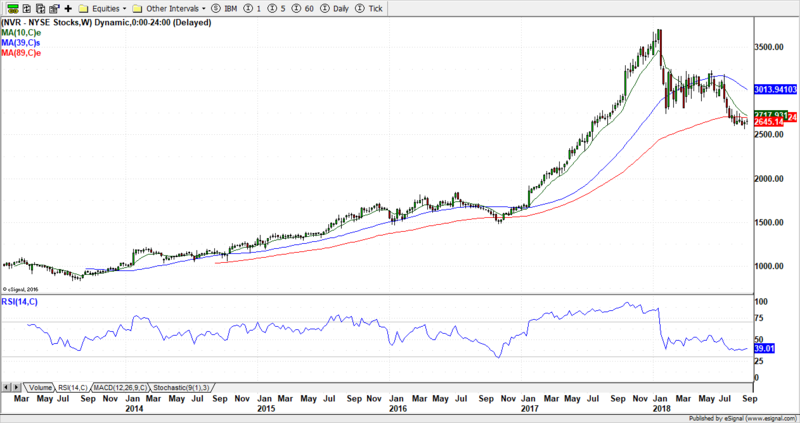 A break below 36.68 would increase the probability of it declining to 61.8% Fibonacci level near 31.08, which is also near a support level of 33.01, the low reached in August 2017. NVR Inc. (see Fig. 4) and Pulte Group Inc. (see Fig 5) re third and fourth biggest components of ITB. They have also broken below February 2018 lows. In mid-July, NVR Inc., $NVR broke below a symmetrical triangle that almost looks like an ascending triangle (see Fig. 4). It also made an ABCD pattern. It provides two targets. A 100% extension of the symmetrical triangle is near 2350 level and the 100% extension target of the ABCD pattern is near 2200. The current price is near 2650, which gives a potential decline of 11%-to-13% for NVR. Pulte Group Inc, $PHM, broke below a symmetrical triangle or a failed triple-bottom pattern. The 100% extension target of the symmetrical triangle is near 20.47 and a 61.% extension target is near 23.25, which are 24% and 13% below the current price of $PHM near 26.86. The top two components of $ITB, D.R. 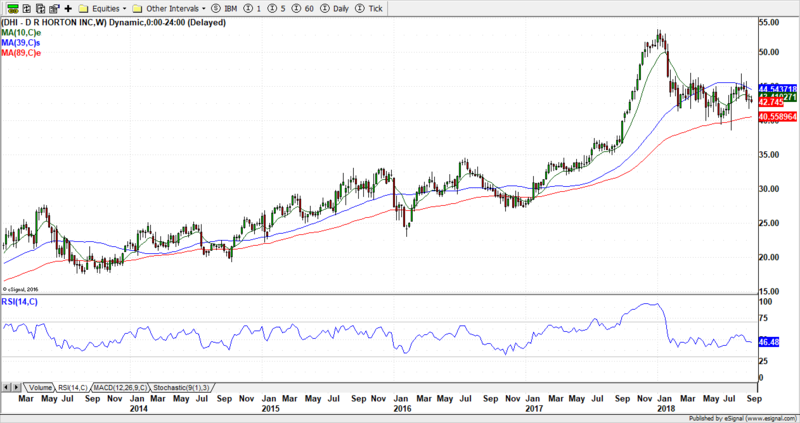 Horton Inc. and Lennar Corp., are trying to hold the fort for the ETF. Though both are also showing weaknesses, they are at significant support levels. D.R. 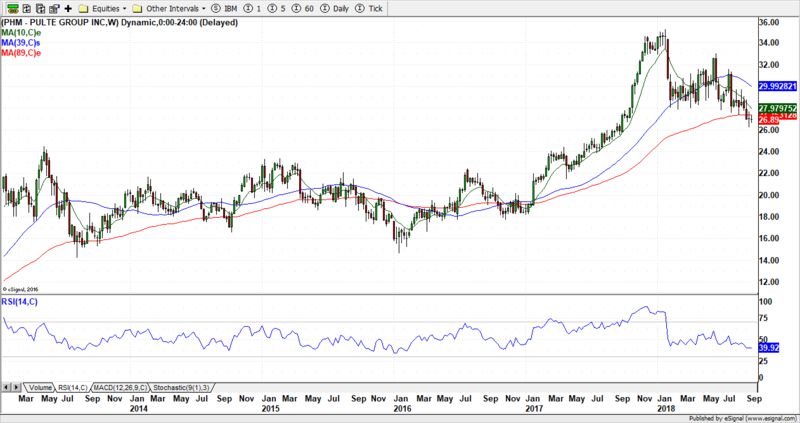 Horton Inc., $DHI, declined from January 2018 high of 53.32 to a February 2018 low of 41.34 before bouncing up to 47.00 in early April (see Fig. 6). It then declined to 38.58 by late July and then bounced up to 46.91, near the April high, by mid-August. At present it is near 42.60 or the midway between these two extremes. 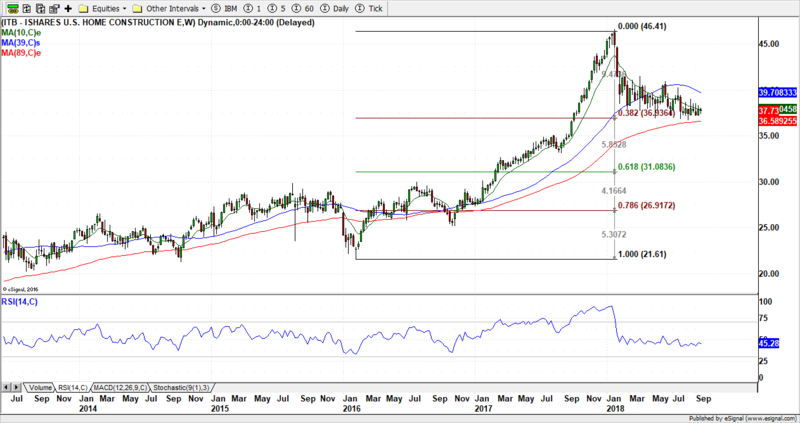 Lennar Corp., $LEN, made a low of 49.52 in September 2017 before rising to all time high in January 2018 (see Fig. 7). It then declined to 48.71, near the September 2017 low, by June 2018 in a zigzag path. The bounce from those lows hasn’t broken above the June 2017 highs of 55.75, which acted as a resistance level. The price is near 51.63, or near the midway between the two extremes. The fate of $ITB depends upon how these two groups fare. If $DHI and $LEN hold their recent lows and break above recent resistance levels they will give a boost to $ITB. It might also make $PHM and $NVR rise in sympathy. On the other hand if $PHM and $NVR continue their decline then they cause more weakness in $DHI and $LEN.